In its ongoing efforts to recover from the Cambridge Analytica scandal this spring, Facebook has detailed its collaboration with a design lab focused entirely on privacy and located in Dublin, Ireland. News of the lab comes from Facebook’s responses to questions from the United States Senate that were released this week by the Senate commerce committee, and follow CEO Mark Zuckerberg’s congressional hearings in April (via Bloomberg). The lab is called TTC labs — “Trust, Transparency, and Control” — and is a cross-industry program that aims to improve privacy controls for services like Facebook and many others. Facebook said that the lab was started “in recognition of the need for improved approaches to data transparency across all digital services.” According to the lab’s website it’s been around for a while, so Facebook likely chose to highlight its partnership with the initiative to earn some favor during the congressional hearings. In another article, TTC labs details how data controls and transparency can be explained to users in ways that are less technical and more familiar to them. Using the example of an app called “Friendlee,” the group built customizable data controls into an ephemeral story format like Snapchat “to educate teens” about privacy and allow them to easily update their privacy settings without needing to navigate confusing menus. Friendlee uses an ‘ephemeral story format’, an experience already embedded in the app, to educate teens to understand and make choices about their data without having to actively look for data settings or deletion. 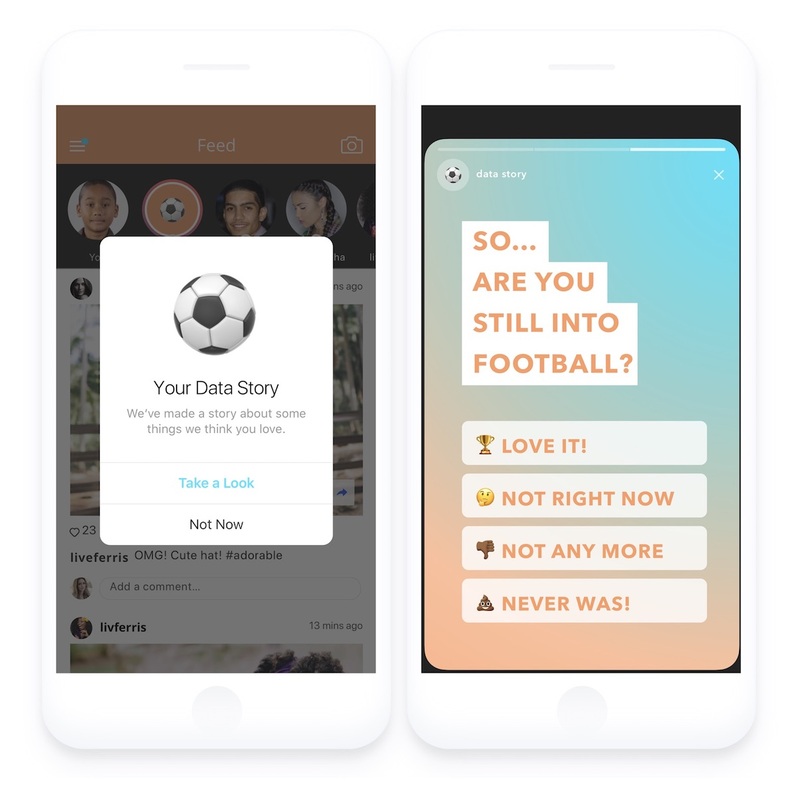 Once they have used Friendlee for a while, it prompts them with a ‘data story.’ This story is about an interest that Friendlee identified, such as football, with the story showing content and actions that have made Friendlee believe they like football. At the end of the story, they are asked whether this is actually true using simple, conversational language. The language around the actions is purposely kept human and is based on self-reflection, not on a technical process like ‘delete this data’. The teen is able to take control of their data without having any knowledge of activity logs or data settings. Instead, they can reflect on it in the context of their own self-identity. It’s important to note that TTC labs’ blog posts are concepts at this point, so it’s unclear if Facebook itself will implement similar features into its own apps and website. In the most recent report regarding Facebook’s data malpractices, the company was said to have forged an agreement with at least 60 device makers like Apple and Samsung to provide access to large amounts of user data without explicit consent. Facebook immediately denied that report from The New York Times, stating that it created specific APIs for device makers so that they could provide Facebook features on operating systems before apps or app stores where available, not to harvest user details. In the weeks following the news of the data controversy, Facebook shared numerous blog posts about policy changes and updates that launched on the social network to enhance its users’ privacy. It appears that TTC labs is the latest initiative in that ongoing privacy effort and should see even more updates to the Facebook mobile apps for iOS and Android in the future.